If I am the awareness in all, why don’t I know what everyone is thinking? Who you really are, is aware of every thought. But who you think you are, is the seeing of a mind/body, which cannot see the thoughts of others. It is like shining a flashlight into a hollow tree trunk. 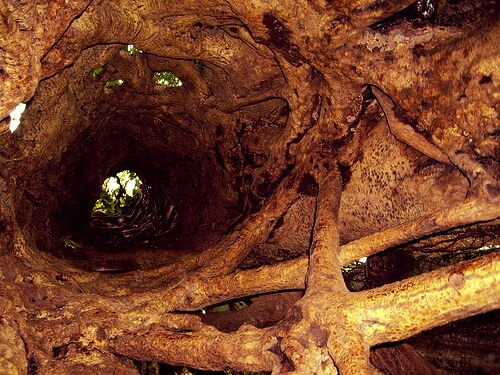 What can be seen is the inside this tree, and the view does not afford a seeing into other trees. Yet this is only if one thinks oneself to be the seeing inside this particular tree. What you really are, is light itself, which both illuminates and sees inside and outside all trees and all other objects. Now, it may be that some sages can tune into the thoughts a particular other person, and being these thoughts into the mind of “their” particular mind/body. But there is no need to desire this siddhi, as its pursuit and possible attainment may merely serve ego and an obstacle enlightenment. During the course of meditation, or simply being, it can be seen that awareness of all thoughts, objects, particles and processes is lik an infinite, blissful song, into which one dissolves completely. But this knowing cannot be contained in the human mind, and simply leaves an impression of love, sacredness and well-being, on the mind/body. This is Sat Chit Ananda, or Being. Consciousness, Bliss. One can marinate in this presence, and its residue, and, by grace, may it “absorb” you completely, by dissolving the ego, into what you always already are.